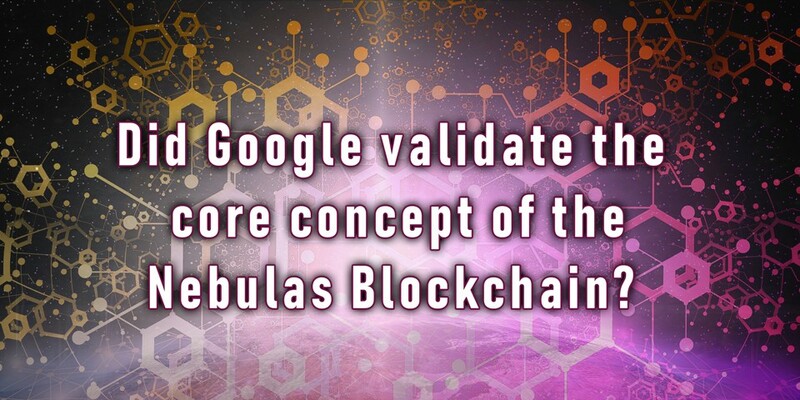 Did Google just validate the core concept of the Nebulas Blockchain? Yep, they did! IBM, Microsoft, Amazon and many of the top companies in the world have shown a deep interest in blockchain technology, and in fact, investing millions in the technology. However, there is one tech giant that has been quiet in this ever-growing field — Google! While Google has been in the forefront of technological evolution, from searching the net back in the 90’s to modern age quantum computing, it’s been a sleeping giant when it comes to blockchain. Well, it seems the sleeping giant has been awaken! Forbes recently published an article about Google researcher, Allen Day, who has been quietly working on the tremendous task of making sense of blockchain data — something that only the blockchain project Nebulas.io has dared to challenge thus far! While I highly recommend that everyone read the Forbes’ article, I would like to share a brief overview, as well as address the similarities with Nebulas’ approach to exploring blockchain data. locate and analyze Artificial Intelligence running on the Ethereum blockchain. analyze and better understand smart contracts. The resulting analytic data became significantly easier to search, providing unique correlations, meaningful data and visualization. The purpose of this program is to understand the possibility of Blockchain and its practical use cases. So, what are the similarities between Google and Nebulas? In the summer of 2017, Nebulas created a proof of concept to visualize and demonstrate the flow of transactions — two years later, Google now has a similar ability. Nebulas, in association with the Bitsclub Vision Program (bitsclubvp.io), is actively looking for blockchain use cases and are working with legacy systems/businesses to see where blockchain can offer better service at lower costs. Google is also working on making sense of the data to see how it can improve its services. Both Google and Nebulas see the on-chain data as a system to create a level of trust service. Both Google and Nebulas analyze and understand smart contracts and the ownership address. Nebulas has a open source algorithm that evaluates on-chain addresses to better understand the “importance” of their transactions and impact on the chain. This feature is known as Nebulas Rank. Google’s version is based on the “BigQuery” service. This image represents a visualization of a Distributed Ledger (XRP) via the data obtained by Google’s BigQuery service. Looks similar to a Nebulas, doesn’t it? Image created by THOMAS SILKJAER/ NICK DESANTIS Visit https://xrpcommunity.blog/the-full-xrp-ledger-visualized/ for more information. So, how does this help Nebulas you may ask? After reading this article, many may immediately think that Nebulas has serious competition and is no longer relevant, however, the opposite is quite true. First, the core concept of Nebulas which is to “Discover Value of Blockchain Data” has now been deemed important by one of the wealthiest companies in the world, and while Nebulas cannot compete with Google’s resources, Nebulas does have a significant head start in this field and better understands the blockchain industry. Nebulas is also creating a unique tokenized economy, whereas at this point, Google has shown no interest in this field. Nebulas is developing both on-chain data analysis as well as a fast and easy to use compute platform for the future of Decentralized Applications. And yes, DApps will be a big part of the future internet. As the original article quotes “Just as Google enabled (and ultimately profited) from making the internet more usable 20 years ago, its next billions may come from shining a bright light on blockchains.” However, Nebulas is already shining a bright, bright light on this important data, and more importantly, sharing the data & soon will be rewarding users based on this data. Fun fact: In July of 2018, the Nebulas team was invited to Google’s headquarters to share the vision of Nebulas. The introduction was also broadcast across the entire Google campus. To those who truly understand the Nebulas vision and agree with the core concepts, I congratulate you because you saw the vision much faster than the world’s largest data centric company! One final thought I will leave you with…. Nebulas is focusing on data in the blockchain world, which in my opinion, makes it a data centric project. In addition, most would agree that Google and Facebook are also data centric companies. While no one can predict the value any of blockchain project, you must make your own decisions; do you think there’s room for growth? Keep believing in blockchain, my friends!